We possess the expertise in manufacturing Continuous Casting Machine Type Rotary Joints. 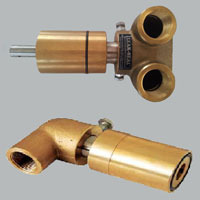 Our Continuous Casting Machine Type Rotary Joints stand in complete conformity with industrial standards and have excellent temperature as well as pressure bearing capacity. We offer Continuous Casting Machine Type Rotary Joints which are easy to operate and especially designed for Continuous Casting Machine Service. Founded in 2010, Leak Seal Engineering is a trusted and reliable name in the arena of mechanical seals for pumps, mixers, reactors, agitators, etc. we are manufacturer, supplier, and service provider of diversified range of mechanical seal products. These product range include Pusher Seal, Non-Pusher Seal, Agitator Seal, Split Seal, Metal Bellows Seal and Seal Support System. These Mechanical seal are similar and Replaceable with Europe and US seal. Our mechanical seals are serving the needs of Dyes & Chemicals, Fertilizer Plants, oil & natural gas, Fertilizer, solvent extraction, power generation Drugs & Pharmaceuticals, Petro Chemicals, Food Processing Plants, Textile Industry, Cement & Sugar Industry, OEMs and many more.